The NFL Combine took place last week which showcased many NFL hopefuls that were judged on various drills, tests, and questions. Since we're just ten days away from free agency starting and sixty nine days away from the NFL Draft, here is my second-to-last Packers Mock Draft I'll be doing until draft day rolls in. No defensive lineman's stock has risen more than Aaron Donald's. Some will question whether he'll even make it to the Packers at Pick 21. Quick on his feet and he fits the role of what Green Bay is looking for in a faster defense over guys like Louis Nix and Ra'Shede Hageman, even though Nix and Hageman are ideal 3-4 linemen. At one point last season at Pittsburgh he led the nation in sacks and loss per tackle. He had an outstanding combine...best of all linemen, some said. I'm banking that the Steelers taking a safety, Chicago drafting Hageman, and Dallas taking Nix or Jernigan, leaving Donald on the board for Green Bay. It's more likely Donald is on the board at #21 overall than it is C.J. Mosely, who is even being considered a Top 10 pick now. 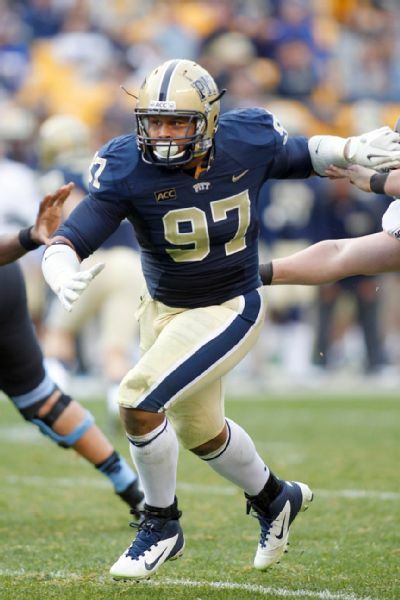 Because Aaron Donald lacks the typical height you would want in a lineman, he could drop down to Green Bay. But don't let his size fool you. Rob Rang of CBS Sports wrote that he "comes off the snap like he was shot out of a cannon". The Packers need someone explosive on this defensive line if Raji, Wilson, Jolly, and Pickett are all gone next year. This is an obvious choice. Clay Matthews has longed for an outside linebacker to mirror him on the opposite side of the field to provide a dual pass rush. Nick Perry was supposed to be that man, but has not stayed healthy enough to prove himself after being drafted just two years ago. And, now with there are talks among the Packers organization that Nick Perry is in line to play more of a hybrid linebacker/defensive end position, the Packers will be looking for depth at outside linebacker. There are multiple reports that indicate Ted Thompson is very high on Trent. Ted and a few members of the scout team spoke with Trent at the Senior Bowl. Murphy is 6'5", 252 pounds which likely means he's better suited to be a linebacker instead of a defensive end. Take the conversation he had with the scouting team with a grain of salt, though. The scouting department will likely talk to hundreds of draft eligible players that will go unreported. However, Trent fits the system and will likely be available in the second round. As noted by Tyler Dunne of the Milwaukee Journal Sentinel, the Packers have a good history of drafting Iowa Hawkeyes. CJ could be the next one to come wear green and gold. Over the last four drafts, Ted Thompson has drafted Iowa players in three of them (Mike Daniels, Bryan Bulaga, and Micah Hyde). CJ has the potential to come into Green Bay and receive the starting role as TE1 with the unlikely returns of Jermichael Finley (injury) and Andrew Quarless (God's awful gift). He'd be a weapon for Aaron Rodgers to utilize across the middle as well as a shield to block for Eddie Lacy and Rodgers. The Packers will likely have an extra pick in the third round when they receive compensation for losing Greg Jennings to the Vikings in free agency. At worst, it would be a fourth round pick, but we'll assume its a third rounder for the time being. Not even Jesus could save the Packer's defense last year, so maybe adding Christian will help? Christian Jones is a tackling machine. He stuffs the running game and creates turnovers. In his senior year he had 7.5 tackles for loss and six quarterback hits. With A.J. Hawk rapidly aging and Brad Jones consistently being inconsistent, its time to add some depth to inside linebacker. NOTE: If Christian Jones is off the board, I'd be very comfortable with Green Bay selecting Michigan State inside linebacker Max Bullough here. Regardless of how his season ended, he's a leader on defense. He has a great understanding of the game. Max had an outstanding combine (4.78 40-yard dash and 30 reps of 225 pounds which was most by any other inside linebacker). If he can prove to coaches that his off the field incident won't repeat itself again, his stock will rise back up to where it was. Another guy Ted Thompson reportedly has his eyes on, Kenny Ladler is one of the most under the radar guys in this draft class. Much like Iowa, Ted Thompson has started to take notice of the talent being produced by Vanderbilt (Casey Hayward and Sean Richardson have come in the last two NFL Drafts). He was selected to the All-SEC team last year and was the only player in college football with five+ interceptions and five+ forced fumbles. He's 6'0", 200 pounds and shows quick speed and potential to be an elite defender. Some draft analysts say he could be just as good if not better than Ha-Ha Clinton Dix and Calvin Pryor. The Packers need all the help they can get at safety, and drafting a play maker is a good start. Don't count free agency out, either. Mike McCarthy recently stated to the media that the Packers will look to take a quarterback relatively early in the draft after everything that happened last year. I don't buy the "early" part, but I do think the Packers may want to look at drafting one to develop. David Fales fits the Green Bay offense the best out of all the quarterbacks that will likely be left at this point, unless of course somehow Alabama's AJ McCarron drops this far down. 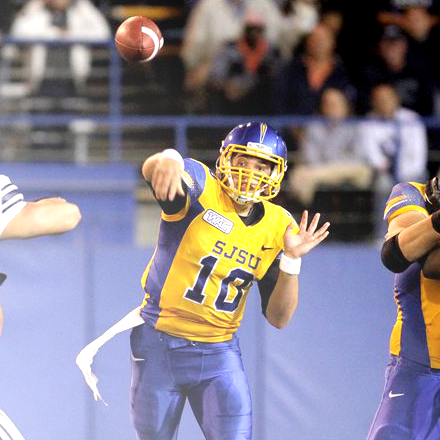 There's not much to dislike about David Fales. He's very accurate. He can pick up yards on his feet if he has to. But, he's classified as a pocket passer. He's got a very decent arm to throw the deep ball. He does a great job at leading his receivers. At San Jose he played under different formations such as shotgun, under center, pistol, etc. He's a little short, but is receiving comparisons to Matt Ryan and Eli Manning. I'd say David would be a perfect project for Green Bay to take on to mold into a solid back up QB for the time being. The sixth round will be where the Packers buy more ammunition for Aaron Rodgers. First Cody Hoffman from BYU. He's BYU's all-time leading receiver with 3,612 yards (prevously held by Austin Collie) over four seasons with the team to go along with 33 touchdown catches. Hoffman had his best game of the year come against the Wisconsin Badgers as he hauled in two touchdowns on 113 yards receiving. With a report stating that James Jones is likely not returning to the Packers next year, the Packers will need to add depth behind Randall Cobb, Jordy Nelson, and Jarrett Boykin. Standing in at 6'4" and weighing 210 pounds, Hoffman is not a very bad WR4 option by any means. With the team's second compensatory pick, the Packers should take another wide out that has kick returning potential as that was something Green Bay couldn't figure out in 2013. Washington ran a 4.46 40 yard dash at the NFL Combine, which is very impressive. He is one of the taller wide outs in this draft as well coming in at 6'4" and weighing 205 pounds. Washington could also fill in for the departing James Jones as stated above. With the team needing a realistic kick returning option and not a flavor of the week like Johnathan Franklin, Jeremy Ross, etc. etc. etc., L'Damian is a great pick especially this late in the draft. Washington caught 15 touchdowns for 1,735 yards during his tenure at Missouri. The dude is 6'8", 316 pounds. With all of the returning linemen that were injured last season, we may want to draft some depth for the offensive line just in case. Plus, Marshall Newhouse does not belong on the team next year in any format whatsoever. If no one gets hurt, he can be placed on the practice squad. With a guy that size potentially available in the 7th round, you take him in a heartbeat strictly for value purposes. Simple as that.